All of the children in Key Stage Two were asked to design a play park for a green space in Arundel. Our school submitted all of the entries and Daisy’s in Year 5 was chosen as the winner. 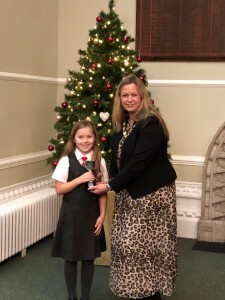 On Thursday, she was invited to an award ceremony at Arundel Town Hall and was awarded a cup for her design which was presented to her by the town Mayor.